PEOPLE who wear glasses will have to ditch their specs in new passport photos from July 1 under new Australian Government rules. The new rule "further strengthens the integrity of the Australian passport", the Australian Passport Office said. 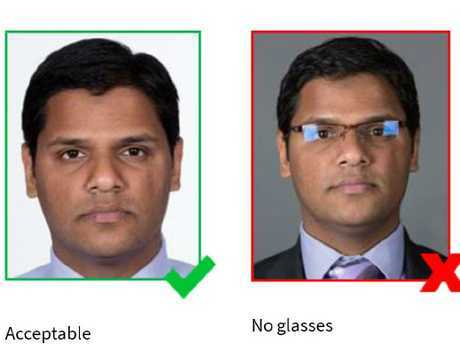 "Research has shown that glasses adversely affect passport facial matching. Matching is more accurate without glasses," the department said. The new rule applies only to new passport applications. Severe sensitivity to light and recent eye surgery may be among the rare exemptions to the new rule, the department said. Vision impairment alone will not be accepted a reason for medical exemption, however. The US Department of State banned glasses from passport photos in 2016, after they were found to be the main reason why pictures were rejected. "[In 2015] more than 200,000 passport customers submitted poor-quality photos which we couldn't accept," the department said. "The number one problem was glasses. We had to put their passport applications on hold because we couldn't clearly identify them from their photo." The new rule comes as Japan's passport was announced as the most powerful in the world, overtaking Germany. The latest Henley Passport Index, which ranks the world's passports according to how many countries it allows visa-free access to, was released this week. Japan topped the list, with its passport allowing visa-free access to 189 countries. Germany and Singapore sat in second spot, with 188. Finland, France, Italy, South Korea, Spain and Sweden came in third, with a visa-free score of 187. Australia was in sixth spot, along with Greece, with a visa-free score of 183.